A Large Full Color Golf Towel that will be used for season after season. 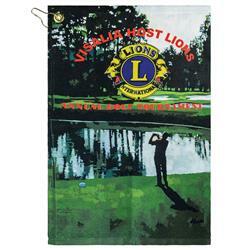 Microfiber face of this plush golf towel can be printed edge to edge with company or event logo. It reverses to super absorbent cotton terry loops on the back side. Great for golf tournaments. Available Colors: Full Color as shown. Starts off as white. Production Times Available: Standard 3 week Production with Paper Proof. Available Imprint Options: Full Color Sublimation. 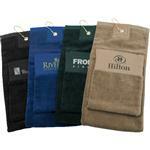 Subli-Cotton terry velour golf towel, 2 lbs/doz, 15"x25"